Size of baby: 6.0 inches, 8.5 ounces. Baby H is the size of a mango. 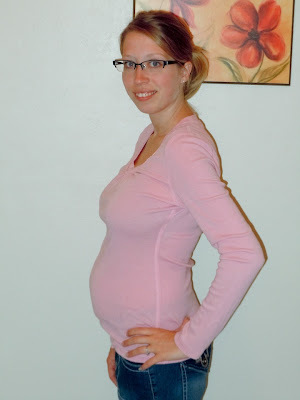 Maternity Clothes: More often then not, but I still have many shirts that aren't and I can still wear them. Gender: Still a surprise-hoping not to blow that this week. Movement: More and more every single day-Jimmy felt in on Wednesday-they get a little stronger each day. Sleep: Getting much better, thankfully.. Symptoms: Tired (beginning to wonder if this is ever going to go away), a little nauseous, CRAZY dreams, and braxton hicks. What I miss: Nothing right now. Cravings: Spicy things...and sour candy. Also, I may have eaten about 27 cookies in the last week. Best Moment this week: Jimmy getting to feel the baby. What I am looking forward to: Our ULTRASOUND!! 2 more days!